This concert has an innovative and creative theme and features some of the most popular and well-known songs, as well as some of the hidden gems from animated movies over the past six decades. 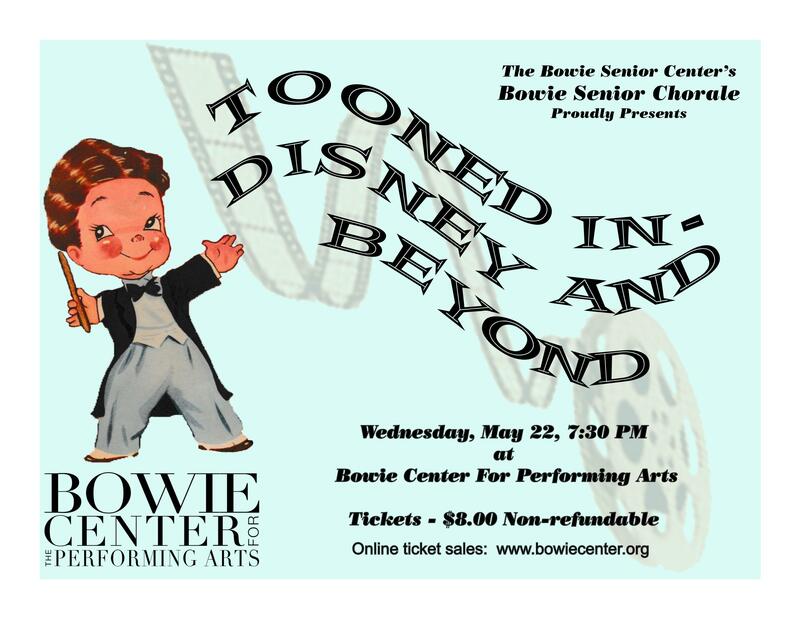 Grandparents, parents and grandkids will recognize and appreciate the musical numbers performed by the 100-member Bowie Senior Chorale. The concert program features songs from famous recent and classic animated Disney movies, including “101 Dalmatians,” “Coco,” “Shrek II,” “Zootopia,” and “Moana,” as well as songs from other animated films. The Chorale will delight the audience with the laid-back reggae, “Under the Sea,” from “The Little Mermaid,” the soaring, “When You Wish Upon A Star,” from “Pinocchio;” and the haunting “Colors of the Wind,” from “Pocahontas” all performed under the talented direction of Craig L.. Sparks. He brings great enthusiasm and expertise to the endeavor and has a unique vision for each concert experience. Paula Sparks is the group’s gifted accompanist.